485-c.380 BCE) "the Nihilist", Greek sophist, pre-socratic philosopher and rhetorician, was a native of Leontini in Sicily. Along with Protagoras, he forms the first generation of Sophists. 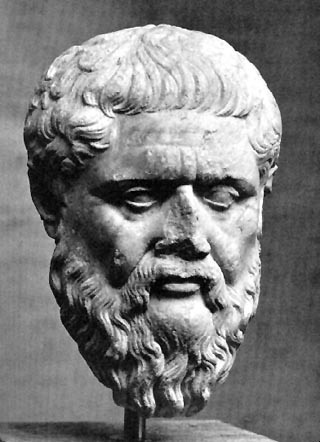 Several doxographers report that he was a pupil of Empedocles, although he would only have been a few years younger. "Like other Sophists he was an itinerant, practicing in various cities and giving public exhibitions of his skill at the great pan-Hellenic centers of Olympia and Delphi, and charged fees for his instruction and performances. A special feature of his displays was to invite miscellaneous questions from the audience and give impromptu replies."